If you need to fly with claustrophobia, you may be anxious about your trip. But flying with claustrophobia need not be a disaster. Carefully planning your trip can help you keep your phobia under control. Although you may be tempted to shop solely by price, it is important to learn the details about a particular airline, route, and specific flight. It may be worth paying more for a flight that meets your needs. Airline: At one time, the legacy airlines offered a full-service experience. The budget airlines trimmed the frills, providing cramped seating and few services in exchange for a cheap ticket. Today, this is no longer the case. Each airline is different, so visit the lines’ websites to determine current policies. Route: Some routes are common among business travelers, making those flights extremely crowded during the week. Others are more popular with vacationers, who often travel over the weekend. Some flights are actually segments of longer routes, which means that the plane you board may already be crowded with those who boarded at an early stop. Research the route you are considering to learn what to expect. Another consideration is whether you will need to change planes. Many city pairs require you to fly to a hub city and board a new plane to your final destination. Hub airports are generally more crowded than regional airports. If crowds trigger your claustrophobia, book a nonstop flight or connect through a smaller city. Specific Flight: A quick web search can provide details on any specific flight. You can discover how crowded a flight normally is and its typical on-time ratio. Although there are no guarantees, learning these details in advance can help you choose the flight with the lowest chance of overbooking or delays. Choosing Your Seat: Which seat is best for you will depend on your unique needs. Many people with claustrophobia prefer to sit in an exit row, which provides additional leg room. Keep in mind that in order to sit here you must be reasonably physically fit and both willing and able to assist in an emergency evacuation should anything occur. A window seat allows you to gaze outside and enjoy the view. Many people feel that this helps them to adjust their focus away from the crowded plane. Sitting on the aisle allows you to easily move around the airplane. Walking around provides a break and can help you manage your symptoms. It also provides easier access to the restrooms, as well as to any comforting items you have in overhead storage. Visit Your Doctor: Several weeks before your flight, visit your doctor and therapist. Even if you do not normally take medications for your phobia, your doctor might want to prescribe a short-term anti-anxiety medication. Pay careful attention to any instructions, which might include starting the prescription a few days in advance or avoiding alcohol consumption. Learn Ways to Cope with Symptoms:Your therapist can teach you coping strategies to use in flight. Guided visualization, breathing exercises, and other techniques can be used while in your seat and may help head off a panic attack. Practice any new techniques in advance, as they may take a while to feel natural. Be Up-To-Date on Airport Security: Airport security regulations seem to change on an almost daily basis. Visit the TSA website a day or two before your flight to be sure you know the latest rules regarding both carry-on and checked luggage. Pack carefully to ensure you are within the rules. Allow yourself plenty of time at the airport. Official guidelines state that you should arrive at least two hours before a domestic flight, and three hours before an international flight. However, you may want to expand that window a bit. The stress of a crowded airport and invasive security screening could put you at risk for a panic attack, and wondering whether you will make the flight will only increase your anxiety. Be hydrated. Once you are through security, you will be able to enjoy the restaurants, shops, and amenities inside the secure area of the airport. Drink plenty of water and try to eat a small snack. Maintaining hydration and blood sugar is important to staying calm. Check in at your gate at least 30 minutes before the flight. Giving yourself plenty of time for this last step of the process will help you stay calm and focused. 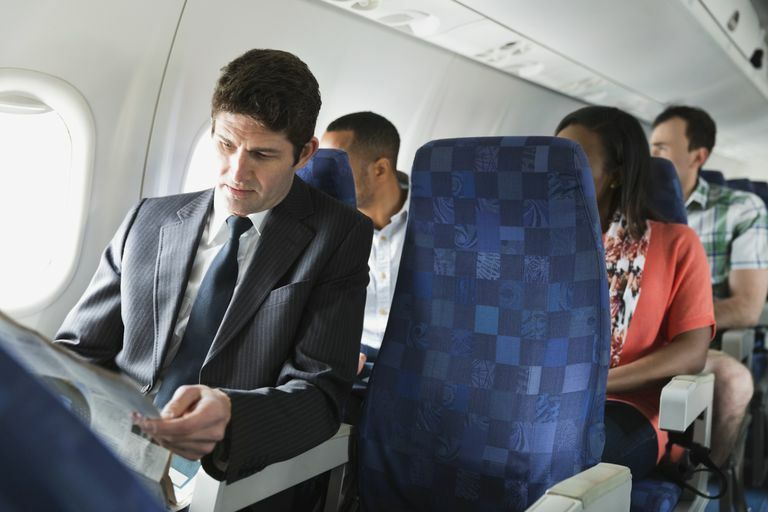 During your flight, keep yourself distracted as much as possible. Bring an iPod, DVD player or laptop, or purchase headphones and watch the in-flight movie. If you are traveling with a relative or friend, engage in conversation. Slip off your shoes and relax with a pillow and blanket. If you have a panic attack, let your traveling partner know. He or she may be able to help talk you down. Otherwise, focus on your coping strategies. Practice coping strategies. Get up and walk around if the seat belt light is off. Go to the restroom and splash cold water on your face. Take anti-anxiety medication according to your doctor’s recommendations, but avoid self-medicating with alcohol. Drinking may actually increase your anxiety. Ask for help if you need it. Flight attendants can handle all sorts of in-flight emergencies including anxiety attacks. Although not trained therapists, they can provide different types of assistance. Do not hesitate to ask for help if needed. Do You Have A Fear or Phobia?